It was good to see up-and-coming stayer Glove Man (pictured)break his maiden at Echuca on Tuesday – and in such good style too. Appreciating a step up in distance to 2124m, the lightly raced-four-year-old travelled well on pace for in-form rider Ryan Maloney – looking the winner a fair way from home. With his rivals off the bit from well before the turn, Glove Man was clear into the straight and just kept going – saluting by an impressive 2 ¾ lengths. “The plan was to really set them alight from the 800m,” Maloney said. Described by Michael Moroney as “a nice stayer in the making,” who has only just “got up to his right trip,” Glove Man is a son of Keeper and the four times winning Prized mare Our Prized Rose. A half-brother to the New Zealand Group Three winner Hammer Down, Glove Man hails from the family of Group One winners Plume and Mac O’Reilly. 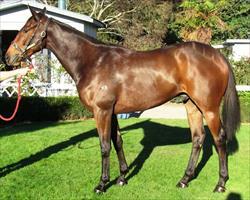 Congratulations to owners Max Brown, David Jackson, Bruce Perry and Grant Devonport. And good luck to the connections of our three runners at Terang on Thursday – Tempest Rock, Devonshire Duke and Barbuda. Still “tossing up” whether or not to run Tempest Rock who has drawn awkwardly out in barrier 14 in the 1600m maiden, Moroney has been happy with the four-year-old’s form this time in. “He is going really well and has certainly improved,” he said. Later in the day Devonshire Duke is due to take his place in the 1400m Showcase event and he too deserves a change of luck having also run into a dead-end at his most recent outing. “He is also going well,” Moroney said, noting that the five-year-old has recovered from a slight set-back that saw him miss his last run – a boil on his wither. “Hopefully he can atone by winning this one,” he said. Contesting the Kevin Brennan Memorial, Barbuda was very good first up but out of the placings second up – going further back than usual in a slowly run race in which it was hard to make up ground. “He can turn that around pretty quickly,” he said – noting that Barbuda is a horse who has always shown talent.